Come visit our apartments located in Tempe, AZ. Our beautifully designed apartments were built with convenience and comfort in mind. 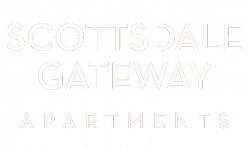 Our goal is to make you feel at home during your stay at Scottsdale Gateway. Our apartments come stocked with features a such as washer & dryers, private patios or balconies, dishwashers, and ceiling fans. To provide extra convenience, our community has a large fitness center with cardio machines, treadmills, and free weights to provide an easily accessible place to exercise. Need to escape the Arizona heat? Take a dip in one of our three recently renovated swimming pools now featuring gas BBQ grills and lounge areas. Sit back and relax in our invigorating spa, take the kids to our on-site playground, or enjoy our pet friendly apartments by taking your pet for a walk around the dog park. Our Tempe apartments are perfect for any lifestyle. We are centrally located on the edge of South Scottsdale and Northern Tempe between Old Town Scottsdale and Arizona State University. We have a variety of dining and coffee options within walking distance such as Starbucks, Zu Izakaya Asian Kitchen, or Green New American Vegetarian.If you want to get a breath of fresh air, the Phoenix Zoo and Desert Botanical Gardens are a ten minutes drive away from our apartments. With easy access to the 101 and 202 freeways, traveling becomes simple and easy. Call or text today (480) 725-4358.